“Stripes can be found everywhere, from zebras roaming in the wild to the latest fashion statement. In the world of microscopic physics, periodic stripe patterns can be formed by electrons within so-called quantum materials. In strongly correlated quantum materials, interactions between the electrons reign supreme. The complex coupling of these electrons with each other – and with electron spins and crystal vibrations – results in exotic phases such as charge ordering or high-temperature superconductivity. 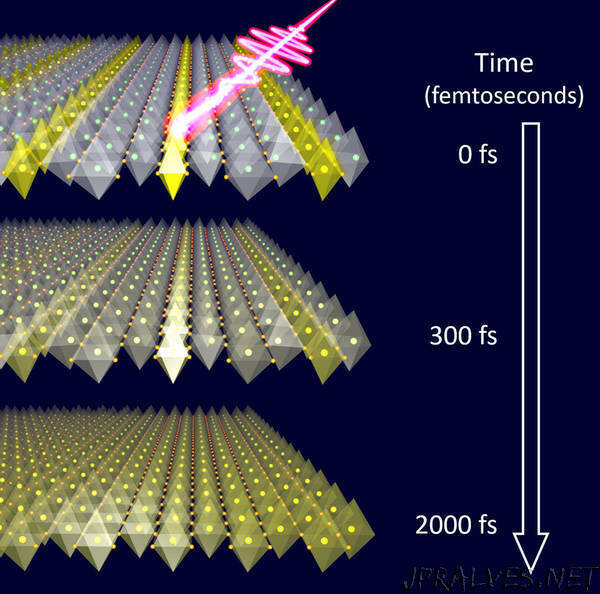 Kaindl and his colleagues have been using ultrafast laser pulses to tease apart the microscopic dynamics of correlated quantum materials to access the interactions among the electrons and with the crystal’s atomic lattice in the time domain. For this study, the researchers worked with lanthanum nickelate, a quantum material and model stripe compound. In particular, the researchers investigated the electronic charges that form the stripe pattern and how they couple to the crystal lattice. How charges interact with the crystal is a key ingredient to stripe physics, the researchers said. Kaindl and Coslovich are corresponding authors of a paper reporting these results in Science Advances. In their experiments, the material is optically excited by a near-infrared laser pulse with a duration of 50 femtoseconds, and probed with a terahertz pulse with variable time delay. A femtosecond is one millionth of one billionth of a second. The researchers found unexpected dynamics when using the laser to disrupt the microscopic order. The interpretation of the experiments was supported by simulations of the phonon dispersion by Alexander Kemper of North Carolina State University. The results provide important insight into the interactions, or “glue,” that couple electrons to lattice vibrations in the lanthanum nickelate. However, their broader relevance stems from recent observations of charge order in high-temperature superconductors – materials where electrical currents can flow without resistance at temperatures above the boiling point of liquid nitrogen. While the mechanism remains puzzling, recent studies demonstrated the ability to induce superconductivity by suppressing stripes with short light pulses.